Get actionable insights to fuel your next marketing campaign! With your customized marketing profile, you will know who your ideal customers are, where they live, what interests them, and how to effectively reach them. 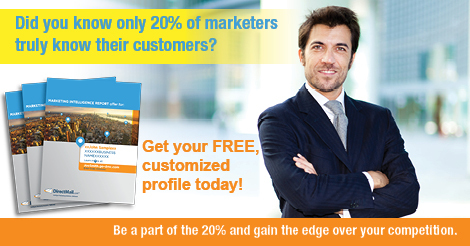 Only 20% of marketers truly know their customers; you will have an edge over your competition! Easy-to-read charts and graphs providing in-depth profiles and geo-insight about YOUR customers. You can utilize the information in this report to target new, ideal customers and grow your business. View a sample Customer Insight Profile! Contact us today to learn how we can help move your organization into the next generation of marketing.